Well the boys (Bob, Brad & Simon) packed their bags and left the land of the long white cloud to do battle with our closest neighbors and ever more competitive Aussies in their sell-out National championships. There had been a heap of hype and we were really excited about playing in Melbourne which sounded like the biggest movers and shakers in Aus at the moment. The course was an hour and a half out of Melbourne in a sleepy little coastal town called Drysdale. The expectation of long flat holes with Kangas bouncing round the snakes and Koalas chomping the Eucalyptus leaves was not the case. Rather, a beautiful park surrounding a lake and some netball courts. 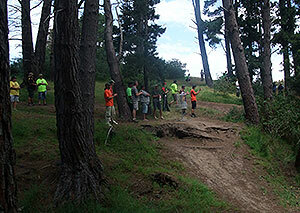 The terrain was undulating and for the practice round a stiff cool breeze made the disc choice crucial. Fergie and Jaz, two local boys, had created a superb championship course with just the right mix of long, short, straight, left, right, up, down, open and technical. I came away wanting to play more of this thoroughly enjoyable course. Competition day saw the temp on the increase and the wind had died to a breeze, the flags marking the holes now sported a variety of portable baskets and the tees were all freshly marked. 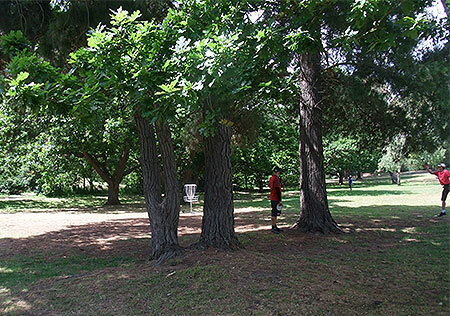 It was amazing to see such a professional setup and disc golfers everywhere abuzz with anticipation. Many of my playing partners described the sense of nervous tension as this was their big one. In the first round which was a random draw I was lucky enough to start on hole 1, a tough par four with about a 6m square landing area 90 - 100m up hill with a low ceiling, a fantastic drive gave you a chance to play an equally accurate 60 - 70m up shot to a well protected basket for a chance at a Birdie. And so it began, my playing partners were great and two of them finished well - Max came 2nd in the J12 and Joel won the Advanced with a score that would have been top10 in the open. Joel had an amazing side arm that even M3 would be proud of. At the end of the first round the GM (Bob) carded a 65, Brad caught the wrath of the course and had a disappointing 68, I had a good solid round of 9 under 54. Happy with my round I was pleased to see I finished up with a 1 stroke lead going into the second round. The second round was seeded and I got to play with the Aussie usual suspects all 3 had been previous tour winners. Kurt, Chris Finn and Luke. Another solid round saw me extend my lead to 2 over Kurt, Both Bob and Brad had improved their scores despite more difficult playing conditions. We were stuffed after two rounds and it was back to the Bach for a quick spa bath before the evening festivities. Greg Bowers had it all well planned and we got to play some lawn bowls before dinner and the ADGC awards and inaugural Hall Of Fame inductions. Next day was fine and going to be warm 28 deg and who should I see sitting in forth place on the top card? None other than our long lost Waikato rep Josh Smith. Bob was scrapping it out for the GM title and was a close 2 strokes behind Aussie Ultimate legend Bruce. Brad was keen for some revenge and managed a 1 under par for his third round. I took my first 5 in the third round but still managed to card another 9 down and extended my lead a further 2 strokes. Bob was chipping away at Bruce but found that the risks he had to take to get up, back fired and he came away with a respectable 2nd place. Josh played well but fell 1 short of making the top 4. The final 9 was just for the open and despite my effort to stay relaxed I found the large gallery a little unnerving as did my competitors fortunately. There was some crazy ups and downs but i managed to hold on and secure my first Aussie open nats title, a nice trophy and a generous cash prize. At the end of the weekend it was clear that the Aussies had successfully raised the bar and ran a very professional event with tonnes of new talent coming through. One thing that was very clear was that this was a team effort and many dedicated eager disc golfers can make these kind of events possible. 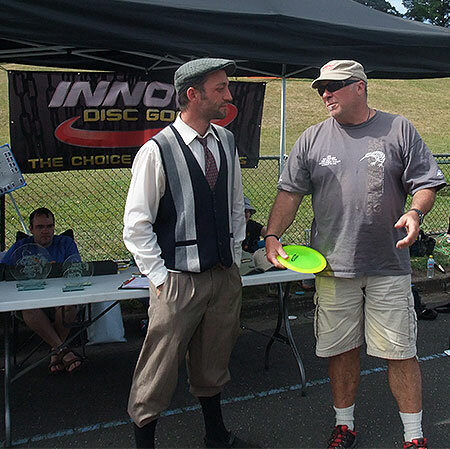 Big ups to Greg Bowers and Aussie disc golf. 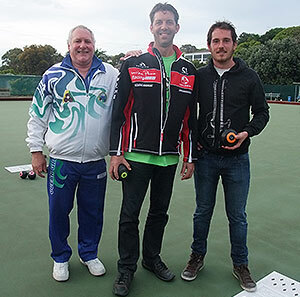 Geelong Mayor Keith Fagg (in suit) wishes the players all the best as the doubles pairings head to the course. 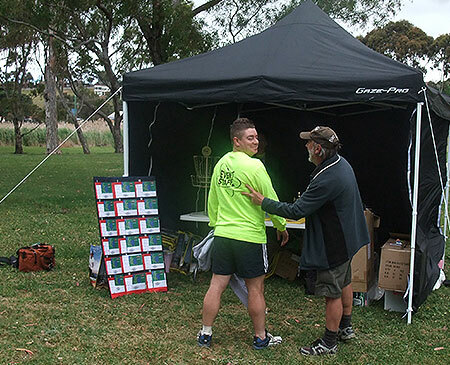 A fully subscribed field of 72 players (including some ultimate players) listen to the final instructions ahead of the 2012 Australian Disc Golf Championship. 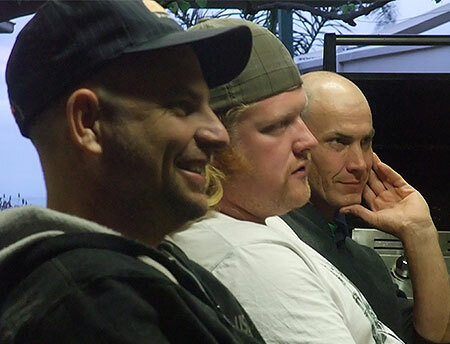 Chris Finn, Dom Lumsden and Luke Williams enjoying the dinner table conversation at the Team Perth hosted BBQ at the beach. 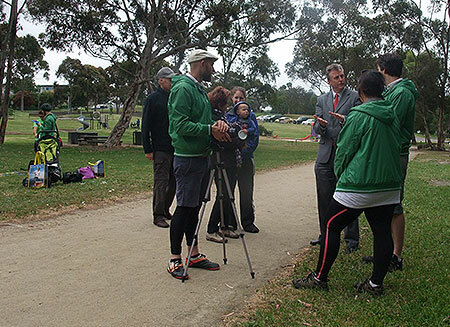 Opening day of the competition and the Mayor of Geelong Keith Fagg came down to show his councils support of Disc Golf in his region (take note Len! - ed.). 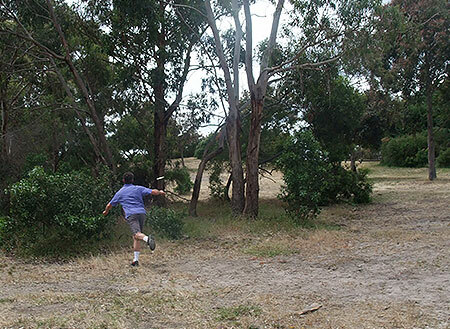 Hole 1 of the final and Kiwi Simon Feasey finds a gap in the trees to put his second close to the pin. 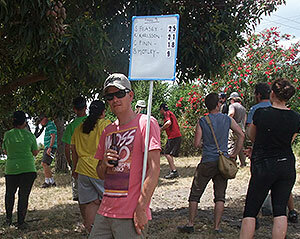 Now very much a part of the Victorian Disc Golf scene Ex-pat Josh Smith took out the random doubles competition. A proud New Zealander an all round top bloke Simon Feasey picks up the 2012 Aussie Title and the lion's share of the prize money (just enough for a new pair of shoes - ed.). 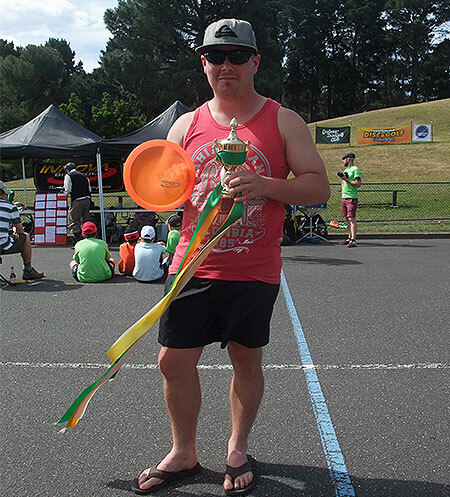 Aussie Disc Gold Hall of Famer Greg Sparksman points out that Kiwi Josh Smith is now batting for the other side. Next he'll be bowling under-arm!. Kurt Karlsson from Sydney lines up a long one as Perth's Chris Finn hopes to close the gap on second. 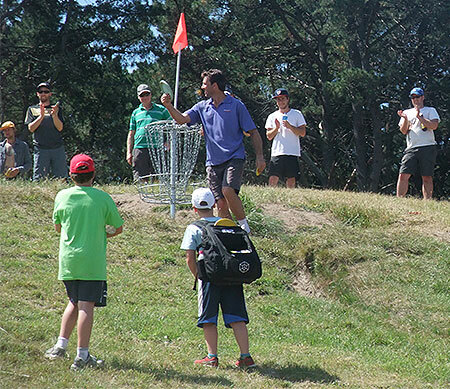 The new Australian Disc Golf Champion .. Kiwi Simon Feasey picks his final putt out of the basket as the crowd applauds a great champion. 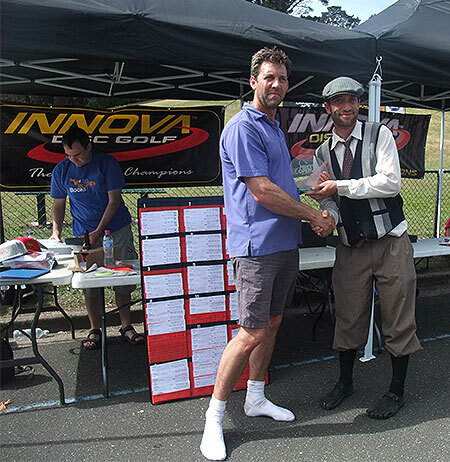 The 'GM' Thanks TD Greg Bowers for a great tournament as he picks up the prize for second in the Grand Masters Comp.